Mix Voice occurs when you centrally blend both chest and head resonance at the same time, allowing you to retain the rich depth and pleasant tone of chest voice with the extensive range of head voice. 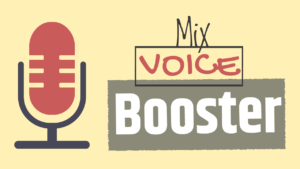 Mix Voice is immediately identifiable in your favourite singers in the way they sing high notes without straining, and the beautiful tone that they achieve with ease. Learning how to strengthen mix voice is easy with these amazing techniques – from projection through to the best mixed voice exercises, this step-by-step guide on how to stengthen mix voice will have you soaring into the heavens like your favourite singers in no time! Along with important singing techniques like support, vowel shaping and connecting chest and head resonance, mix voice is one of the most impirative stepping stones along the way to building the voice of your dreams. Are you ready to find your mix? If we think of chest voice and head voice as two forms of resonance, then mix voice is the central balance that occurs when you blend between the two. If you’ve ever sung a lip-trill vocal exercises and it connected between chest and head voice without a break, then you’ve actually passed through your mix voice – albeit a very stunted and brief mix, but mix nonetheless. Mix voice can be developed in a number of different ways, from creating a specific tonal quality that is only possible with a blend of resonance right through to mechanical exercises and scales designed specifically to encourage and strengthen mix voice. If you sing a low note, it’s easy to identify your chest resonance. Many people feel this resonance in their chest (hence the name) or even in the teeth or the mouth. Now, head resonance is also easy to identify when you sing a pure head tone in your high range – don’t worry about singing loud or with a full tone, just sing a head tone and try to identify where the resonance occurs. Most singers experience head resonance at the back of the head in the pharynx, or even between the eyes or partially in the nose. Making this definition between the registers in a resonant sense is the first step to strengthen mix voice. As you ascend in range on your favourite scale, make a point of focusing on BOTH of these two areas of focus and try to let them ‘ping’ together at the same time instead of handing off between the two. By maintaining a combination or resonance that balances between chest and head, you can strengthen head voice with various exercises. Classroom voice, as the name suggests, is the tonal quality you would use to get the attention of children in a classroom – you don’t want to yell at them, but you can’t be meek and light – it should be assertive but pleasant, like “Okay everyone, look over here!” in a commanding but friendly tone. This specific tonal quality is unique to the middle coordination where there is the depth of chest, but release of head voice. By shifting your focus away from either chest and head voice through the middle of your voice, it’s easy to kick-start your mix with the concept of projection. As you ascend up towards your first vocal break, instead of pushing chest voice and eventually releasing or flipping up into head voice when you can no longer withstand the pressure, imagine that your voice is being projected back to you from a far away point, like the corner of the room or the back of an auditorium. By focusing on projection through the middle voice, you will achieve the powerful blend of resonance that occurs when you balance in mix voice. Mix voice requires a special touch and figurative approach in the beginning stages of building your middle voice. With the intention of blending both chest and head resonance instead of ‘singing higher in chest voice’, you will achieve the rich tonality of chest voice with the range of your head register. You can even define middle voice as “full voice in head voice” and in a physical sense, this is more what it feels like as there is very little engagement of the Vocalis muscles, which create vocal fold weight by contracting the vocal folds in the lower range. Silence – Chest voice isn’t the resting phase of your voice. By making the definition between chest and the feeling of ‘silence’ you can train coordination of the Vocalis muscles and learn to drop weight as you ascend. Learning how to strengthen mix voice has absolutely changed my baritone voice and has played a large part in turning my formerly stunted bassy voice into a formidable range machine. How will mix voice change your voice? Let’s find out in our new mix booster course. Another great place to start is the free Foundation 101 course available here at Bohemian Vocal Studio which will show you how to set up a rock solid foundation for your tone, range and mix voice to develop upon. Foundation in singing really is just like the concrete slab that a house is built upon – the rock solid foundation that your walls (tone) and roof (range) are built on. When you’re ready to take your voice to the next level, you’re welcome to Book a Skype Lesson with me and we’ll start working towards extending your range and developing balance, control and a solid mix every time you sing! If you have any questions about learning to sing in middle voice or how to strengthen mix voice, feel free to leave any feedback or questions below!